Officials with the Oklahoma Lottery say that a couple recently won a $50,000 Powerball drawing when they purchased a misprinted ticket that someone else didn't want. 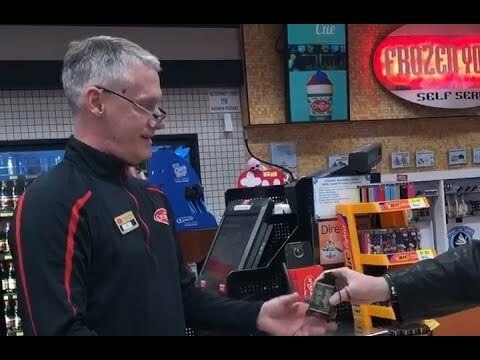 Earlier this week, the couple surprised the clerk that sold them the ticket with a portion of their winnings. 46 comments. Last comment 18 days ago by noise-gate. That was real nice of the couple. MY wife and I always try to tip the clerks who sell us winning scratch offs or whatever as long as the store's policy allows it. Really enjoy feel good stories like these. So nice of them to give some of the money to the clerk. Funny thing person who refused the ticket will never know, hidden Karma there. (Maybe individual was hateful? ), we'll never know. Truly a christian couple with christian values that people should follow. Judging by his mannerisms and how well groomed he is, he looks like he's the owner and not just a clerk. Dude is probably a multi-millionaire and owns 4 stores. LOL. At least he can gas up his million dollar 45 foot Prevost now. I don't know about that, if they were good Christians according to a lot of good Christians, they wouldn't be playing the lottery. I've played the lottery all over this country and in other countries and Oklahoma and Texas were the two places where the Christians, especially the Christian clerks are very against the lottery and visibly indignant when you play, sometimes even making comments; in fact Texas doesn't even have any drawings on Sunday. There are many churches that are against the lottery and claim they wouldn't take any donations from lottery winnings, although I am skeptical about that. Also nowhere in the 32 second video did they say they were Christians, the only thing we know about them is that they are Caucasian. Last time I checked people of all races and religions and even no religion have very good and generous people and also very bad and selfish people, has nothing to do with being a Christian, I mean look at Catholic priests, doesn't get any more top of the food chain Christian than that and we all know what they have done. About Catholic Priests. It has been said that if the Catholic Church ever totally failed it would be because of the Priests. But God loves his Church. Do not deny the Power of God. Here in America there are many denominations of Christianity. We do have disagreements. There is that person in the New Testament who stopped and saved a stranger who was beaten and robbed while the Priest, Rabbi, and others walked by and ignored the poor person. The Good Samaritan. We agree to disagree peacefully. The video was very short and didn't say how much they gave. I suppose that whatever it was, it was a nice gesture. Congrats on the win. Just imagine if the ticket was purchased with Powerplay. Are you for real? Being well groomed and taking pride in your appearance does not make you a millionaire. It has been my experience that the wealthier someone is, the more likely they are to dress more casual. This page was generated in 0.1207 seconds.